The Simms Creek site (41LM113) lies on a low terrace of a small creek in the Lampasas Cut Plain. Once thought to represent an early Late Prehistoric camp – or even a bison jump – predating the Toyah phase, radiocarbon dates on hearth charcoal indicate a historic date sometime between 1660 and 1780. The very large animal bones that were initially identified as cattle are now known through DNA testing to belong to bison. 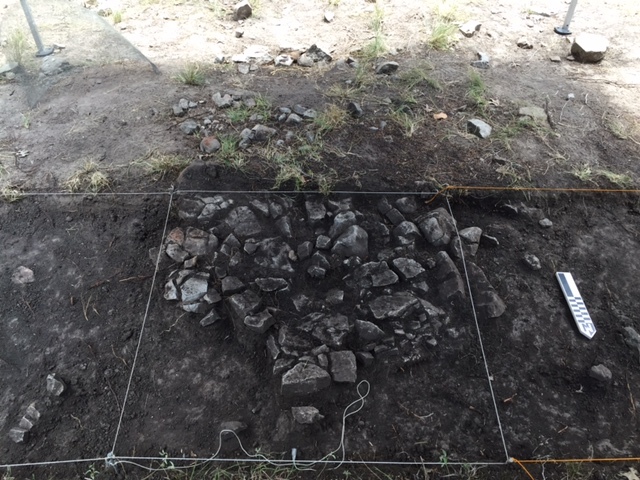 Partially excavated burned rock pavement. Note rocks in upper part of photo that have eroded downslope. Click image to enlarge. 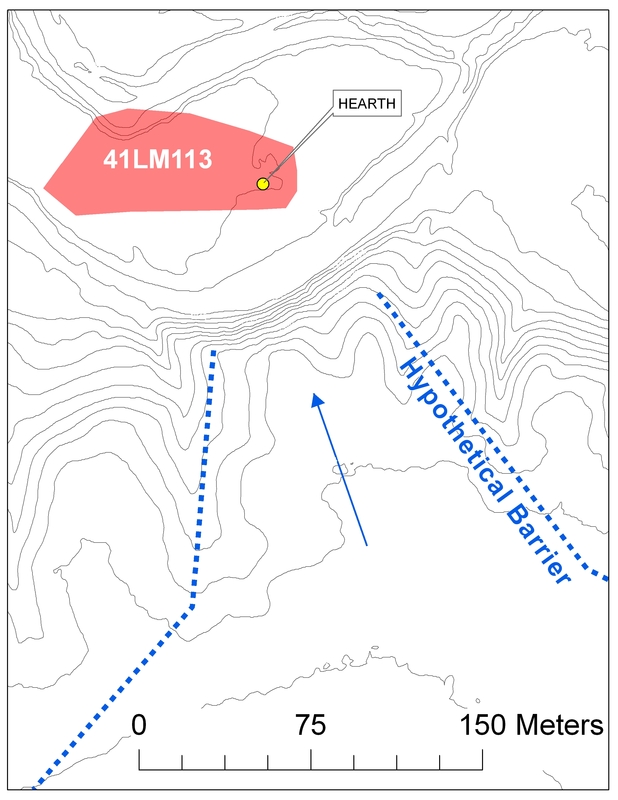 Contour map showing location of 41LM113 and possible bison jump. Click image to enlarge. 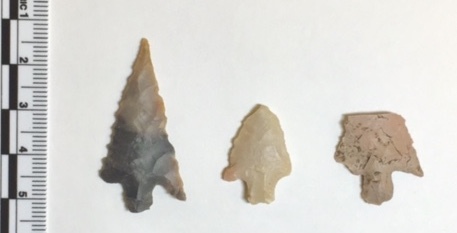 The artifact assemblage contains elements of the Toyah toolkit with bone-tempered pottery and tear-drop end scrapers, but as with the Wilson site (41SS186) 20 miles to the west, the site lacks Perdiz points. The arrow point could be typed as Alba or Bonham, types thought to have gone out of use around AD 1250. LUAS plans to return to the site to rule out the presence of earlier components (occupations), search for more evidence of historic occupation, and investigate the possible bison jump area which could explain any multiple use of the area. 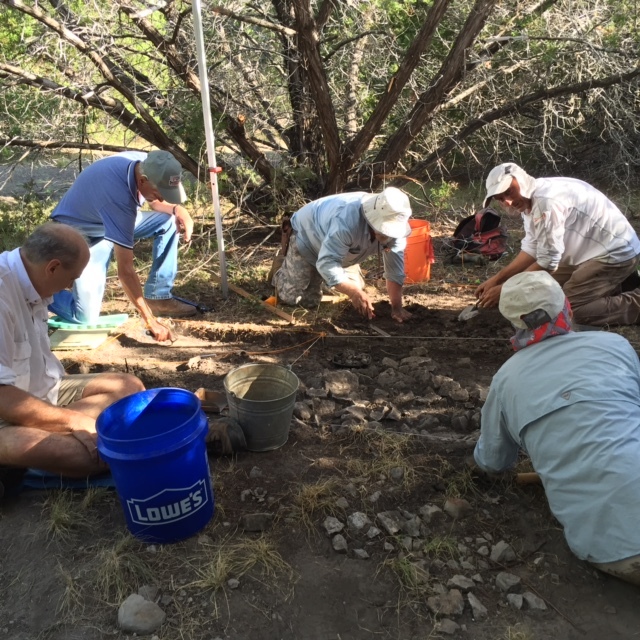 LUAS members excavating hearth area of 41LM113 in summer 2016. Click image to enlarge.